Howard Waitzkin is Distinguished Professor Emeritus of Sociology at the University of New Mexico and practices internal medicine part-time in rural New Mexico and Illinois. His books include Medicine and Public Health at the End of Empire (Paradigm, 2011). Ida Hellander is a longtime advocate for single-payer health reform in the United States. As the Affordable Care Act (ACA, otherwise known as Obamacare) continues along a very bumpy road, it is worth asking where it came from and what comes next. Officially, Obamacare represents the latest in more than a century of efforts in the United States to achieve universal access to health care. In reality, Obamacare has strengthened the for-profit insurance industry by transferring public, tax-generated revenues to the private sector. It has done and will do little to improve the problem of uninsurance in the United States; in fact, it has already begun to worsen the problem of underinsurance. Obamacare is also financially unsustainable because it has no effective way to control costs. Meanwhile, despite benefits for some of the richest corporations and executives, and adverse or mixed effects for the non-rich, a remarkable manipulation of political symbolism has conveyed the notion that Obamacare is a creation of the left, warranting strenuous opposition from the right. The overall structure of Obamacare is not new. Similar “reforms” have appeared in other countries over the last two decades. The year 1994 was a significant one for health reform worldwide. Colombia enacted a national program of “managed competition,” to replace its existing health system, which had been based largely on public hospitals and clinics. The World Bank mandated and partly financed the reform, and President César Gaviria and his colleagues promoted the reform to financial elites at the World Economic Forum and elsewhere. That same year a similar proposal, designed by the U.S. insurance industry and spearheaded by Hillary Clinton, was advanced but ultimately abandoned. The right wing opposed the plan as a big-government boondoggle, while on the left, opposition centered on the massively increased, tax-subsidized role that the plan would create for the private insurance industry, especially a handful of the nation’s largest companies. During the 1990s, several European countries considered proposals for health reform that followed a similar model of privatization, “managed competition,” and increased access of the private insurance industry to public health care trust funds.7 Although a few, like the Netherlands and the United Kingdom, implemented elements of such reforms, most European countries did not, acceding to opposition from left-oriented parties, labor unions, and civic organizations. Then, in 2006, Republican Governor Mitt Romney in Massachusetts implemented a reform that required all state residents to buy insurance through the state system if they did not already hold insurance coverage. Romney later disavowed the reform during his 2012 presidential campaign, but the same overall structure re-emerged in Obamacare. While framed as programs to improve access for the poor and underserved, these initiatives facilitated the efforts of for-profit insurance corporations providing “managed care.” The corporations could collect prepaid capitation fees or other premiums from government agencies administering trust funds, as well as from employers and patients, and could invest the reserves at high rates of return. Insurance corporations also profited by denying or delaying necessary care through strategies such as utilization review and preauthorization requirements; cost-sharing such as copayments, deductibles, co-insurance, and pharmacy tiers; limiting access to only certain physicians; and frequent redesign of benefits. Such proposals fostered neoliberalism. They promoted multiple competing, for-profit, private insurance corporations. Programs and institutions previously based in the public sector were cut back and, if possible, privatized. Overall government budgets for public-sector health care were reduced. Private corporations gained access to public trust funds. Public hospitals and clinics entered into competition with private institutions, their budgets were determined by demand rather than supply, and prior global budgets for safety net institutions were not guaranteed. Insurance executives made operational decisions about services, and their authority superseded that of physicians and other clinicians. By 1977, only four years after leaving the defense sector, Enthoven offered the Carter Administration his proposal for a Consumer Choice Health Plan. Although Carter rejected the plan, Enthoven soon published the proposal.13 In this early work, Enthoven presented the basic concepts of most subsequent health reform proposals; Obamacare incorporates this same overall structure. During the 1980s, Enthoven collaborated with managed care and insurance executives to refine the proposal. A new name, “managed competition,” proved attractive to business leaders, who met regularly in Jackson Hole, Wyoming.14 The five largest insurance corporations funded this group, as well as providing support for Bill Clinton’s presidential campaign and Clinton’s Health Security Act. The neoliberal health agenda, including Obamacare, emerged as one component of a worldwide agenda developed by the World Bank, International Monetary Fund, and other international financial institutions. This agenda to promote market-driven health care facilitated multinational corporations’ access to public-sector health and social security trust funds. An underlying managerial ideology claimed, nearly always without evidence, that corporate executives could achieve superior quality and efficiency by “managing” medical services in the marketplace.16 Enthoven and colleagues in academic health economics participated in this effort, refining terms and giving the enterprise a scholarly credibility. Health reform proposals across different countries have resembled one another closely. The specific details of each plan appeared to conform to a word-processed, cookie-cutter template, in which only the names of national institutions and local actors have varied. Six broad features have characterized nearly all neoliberal health initiatives (Table 2). Excise tax on “Cadillac” private plans that exceed a specified cost limit. † Sources: patients, employers, public sector trust (“solidarity”) funds (the latter being “contributory” for employed workers; and “subsidized” for low income and unemployed). ‡ Sources: patients, employers, public sector trust funds—Medicaid, Medicare. 1. Organizations of providers. One element of neoliberal proposals involves large privately controlled organizations of health care providers. These organizations operate under the direct control or strong influence of private, for-profit insurance corporations, in collaboration with hospitals and health systems. The organizations may employ health care providers directly, or may contract with providers in a preferred network. In the Clinton proposal, these organizations were named Accountable Health Partnerships (AHPs). In Obamacare, they are called Accountable Care Organizations (ACOs). (Technically, ACOs are supported only in Medicare, although Obamacare accelerated organizational consolidation in anticipation of broader implementation of payment reform.) The Colombian health reform labels them Provider Institutions of Health Services (Instituciones Prestadores de Servicios de Salud, or IPSSs). 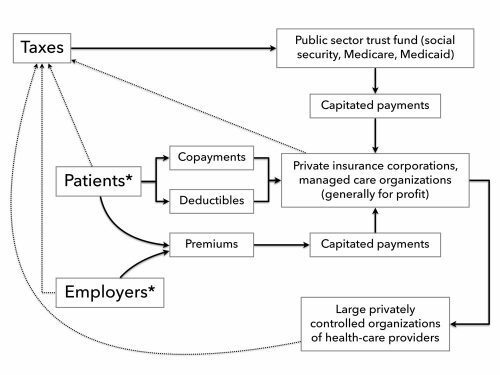 In this model, for-profit managed care organizations (MCOs), usually subsidiaries of multinational insurance corporations, offer health plans competitively. In reality, competition is constrained by the small number of organizations large enough to possess the financial resources and infrastructure required under the reform proposals, as well as consolidation in the private insurance industry. The MCOs contract with or employ large numbers of health practitioners. This approach drastically reduces medical practice based on fee-for-service reimbursement. Instead, physicians and hospitals are largely absorbed into MCOs. Such organizations purchase or facilitate the purchase of health plans from private insurance corporations, which in turn contract with large privately controlled organizations of health care providers (such as the AHPs, ACOs, or IPSSs described above). In the United States, the marketplaces serve the “non-group market”—mainly people who previously paid for their own coverage or were uninsured. Private health plans on the marketplaces are heavily subsidized from general tax revenues, while public programs such as Medicaid and Medicare are rapidly becoming privatized. Instead of 1 to 2 percent overhead, as in the traditional Medicare program, private Medicare Advantage plans show overhead costs and profits of at least 14 percent.19 In Colombia, purchasing organizations contract with provider organizations to deliver care for the previously uninsured, with funding provided by the federal government through national and local tax revenues and a payroll tax (termed the “subsidized regime”), and other purchasing organizations contract with companies that provide health insurance for workers and their families through the social security system (the “contributory regime”). 4. Tiered benefits packages. Neoliberal proposals define benefits packages in hierarchical tiers. The national reform provides a minimum package of benefits that experts view as essential, and individuals or their employers can buy additional coverage. Poor and near poor people in the U.S. Medicaid program are eligible for benefits that used to be free of cost-sharing, but since Obamacare passed, states increasingly have imposed premiums and copayments. With “minimum benefits packages,” for instance, all women are entitled to pap smears. But treatment of cervical cancer revealed by pap-smear screening would not necessarily be covered, or might require cost sharing, leaving women vulnerable to different local government funding and policies. Benefits for treatment of cervical cancer for poor women with positive pap smears have varied according to the financial resources and policies of different states or municipalities. This variability has occurred in Colombia, Mexico, and other countries that have adopted minimum benefits packages. In the United States, neoliberal reforms also have included tiered benefits packages. The Clinton proposal aimed to create “uniform effective health benefits” required under all health plans, but it also would have allowed the sale of additional benefits to patients or employers able to afford them. Under Obamacare, a package of minimum essential services may be only partially insured. Various metals—bronze, silver, gold, platinum—identify the tiers of coverage, where bronze represents the lowest tier (covering 60 percent of in-network health care expenses) and platinum the highest (90 percent). Individuals’ and families’ premiums cost the most under the most valuable metal, and their out-of-pocket copayments average the least. However, these percentages represent actuarial calculations of the insurance companies’ financial payouts for services during a year among all beneficiaries at a specific tier; therefore, an individual or family expecting 60 percent coverage may pay much more in actual premiums, deductibles, and copayments. Under Obamacare, the “value” of coverage in a tier is strictly a financial calculation, based on actuarial principles in accounting. Similar tiered benefit approaches to both services and medications have been instituted within managed care programs under Medicare (as well as Medicare Part D, for medications) and Medicaid. 5. Complex multi-payer and multi-payment financing. 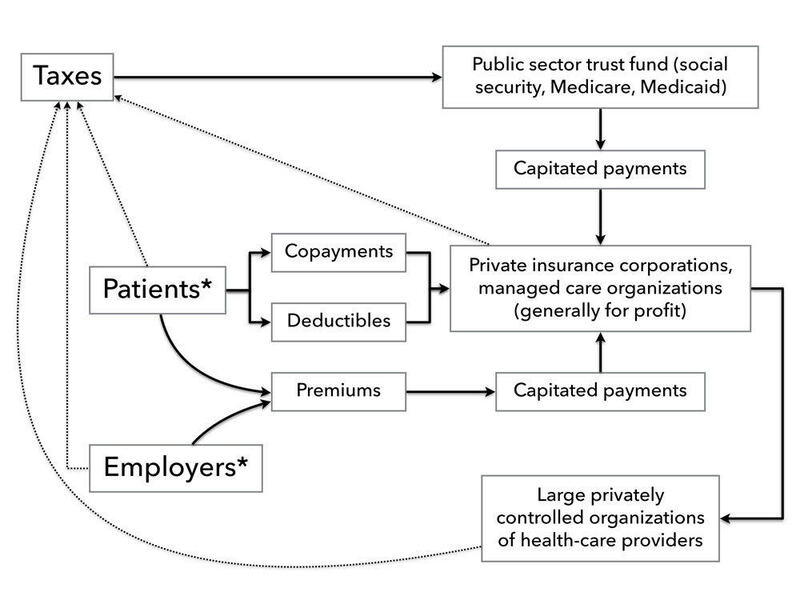 Financial flows under neoliberal health policies are very complex (Chart 1). The costs of administering these flows and other components of neoliberal policies also are quite high (about 25 to 28 percent of total health care expenditures) and keep increasing. Under Obamacare, administrative overhead—also referred to administrative “waste,” since the costs do not contribute to direct patient services—grew 10.6 percent in 2014, faster than any other component of health care except medications. Private insurance overhead is projected to increase by $273.6 billion from 2014 through 2022.22 Below, we describe the structure and sources of these various financial flows. * Purchase of insurance policies for employers and patients mediated by large organizations of health care purchasers. Inflow of funds: Funds for capitation payments come from several sources. One source involves premiums paid by workers and their families. Contributions from employers comprise a second source. The proportion of premiums paid by workers and their families versus that paid by employers differs according to the benefit package selected by employers. Public-sector trust funds provide a third source of capitated payments. Low-income individuals and families, the unemployed, and those without employer-provided health insurance are subjected to a “means test” requiring full documentation of their financial resources and expenses. Those with incomes below this means-tested limit, after other resources such as homes, cars, and prior savings are considered, receive a subsidy from a public-sector trust fund. Under the Clinton plan and Obamacare, the trusts funds have involved Medicaid and Medicare. Medicaid trust funds include federal and state components that vary widely according to state-level decisions about using state revenues to improve eligibility and covered services under Medicaid. In the Colombian health program, the national social security system into which employees and employers contribute for health and retirement benefits became a public-sector trust fund (Fondo de Solidaridad y Garantía [Fund of Solidarity and Gaurantee], or FOSYGA), used for capitated payments to private MCOs. Another trust fund, intended for the poor and uninsured, was created from the tax-generated budgets of the national Ministry of Health as well as the regional, state, and municipal health authorities (Fondo de Solidaridad del Régimen Subsidiado [Solidarity Fund of the Subsidized Regime]). Copayments and deductibles comprise a fourth source of payments. Copayments require out-of-pocket payments that patients make at the time that they receive services. The rationale for copayments rests on the largely untested assumption that people are less likely to use unneeded services if they must pay something when services are provided (the “point of delivery”). For the insured, the size of the copayments usually decreases as premiums increase. Under Obamacare, for instance, those who pay higher premiums for the more precious metal plans usually pay lower copayments at the point of delivery. The evidence that copayments reduce unnecessary utilization for the non-poor is very limited; for the poor, there is strong evidence that copayments of any size reduce necessary care.24 Deductibles are payments that patients must make at the beginning of each period of insurance coverage, before the insurance will begin to pay. In principle, deductibles are likewise intended to reduce unnecessary utilization, but like copayments, actually can become barriers to obtaining needed care. For instance, the least precious metal tiers of Obamacare require deductibles as large as $6,000 per person per year, inhibiting patients from seeking anything other than catastrophic care. Taxes are a fifth source for the inflow of capitated funds to insurance corporations. Workers pay such taxes as a deduction from their pay, and employers pay taxes as a proportion of their payrolls. In neoliberal programs, these payroll taxes shift to public-sector trusts funds and then enter the flow of funds that MCOs receive for capitated services. But most neoliberal health programs also depend on additional taxes, usually general income taxes, to create and maintain the public-sector trust funds devoted to care for the poor. In the United States and Colombia, the income tax system remains regressive overall, as the rich pay a proportionately much smaller part of their income as taxes, exploiting the tax code’s myriad loopholes and exemptions. As a result, the non-rich contribute proportionally more to neoliberal health programs through taxes, on top of their premiums, copayments, and deductibles. 6. Changes in tax code. Partly because they increase administrative costs and profits, neoliberal reforms usually lead to higher taxes. In Colombia, payroll taxes for employers and employees have increased substantially, to approximately 11 percent.25 Under the Clinton proposal, changes in the tax code would have restricted corporate and individual tax deductions for health insurance, therefore providing incentives to purchase less expensive coverage overall. Obamacare reduces tax deductions and imposes a tax for so-called Cadillac insurance plans that go beyond the specified minimum coverage standards. In addition, Obamacare calls for penalties, administered by the Internal Revenue Service, for those who do not purchase mandatory insurance coverage. One rationale for tax code changes usually involves claims that reduced tax deductions and tax penalties for non-adherence will lead to decreased overall costs for health care. However, the increased administrative costs of restructuring the tax code and then enforcing those changes generally go unrecognized. Advocates of neoliberal health reform have produced evaluations that, as expected, show favorable results. For instance, the 2000 World Health Report of the World Health Organization (WHO), supported in part by the World Bank, ranked the world’s health systems using a conceptual orientation and methodology that received criticism worldwide.26 In the rankings, “choice” of insurance plan was a defining criterion in evaluating health system performance. From this perspective, universal, publicly delivered health systems that covered everyone but did not encourage choice among private insurers ranked lower than those that did. As a result, Colombia (ranked 22nd in the world and first in Latin America), Chile (33rd), Costa Rica (36th), and even the United States (37th) ranked higher than Cuba (39th), despite Cuba’s much admired, accessible health system and outstanding health indicators. Brazil ranked very low, 125th, due to its attempt to achieve a unified health system, codified in the Brazilian constitution of 1988. Many countries have rejected the neoliberal model, and have instead constructed health systems based on the goal of “health care for all” (HCA). Such countries strive to provide universal access to care without tiers of differing benefit packages for rich and poor. For instance, Canada prohibits private insurance coverage for services provided by its national health program. Because Canada’s wealthy must participate in the publicly financed system, the presence of the entire population in a unitary system assures a high-quality national program. In Latin America, countries trying to advance the HCA model include Bolivia, Brazil, Cuba, Ecuador, Uruguay, and Venezuela. The inevitable failure of Obamacare may open a space, finally, for even the United States to pursue a national health program that does not follow the neoliberal model. As a non-neoliberal model, a single-payer national health program (NHP) in the United States essentially would create “Medicare for all.” Under such a plan, the government collects payments from workers, employers, and Medicare recipients, and then distributes funds to health care providers for the services that Medicare patients receive. Because it is such a simple system, the administrative costs under traditional Medicare average just 1 to 2 percent.38 The vast majority of Medicare expenditures pay for clinical services. Such a structure has achieved substantial savings by reducing administrative waste in Canada, Taiwan, and other countries. The following features of a single-payer option come from the proposals of Physicians for a National Health Program (PNHP), a group of more than 20,000 medical professionals, spanning all specialties, states, age groups, and practice settings.39 According to the PNHP proposals, coverage would be universal for all needed services, including medications and long-term care. There would be no out-of-pocket premiums, copayments, or deductibles. Costs would be controlled by “monopsony” financing from a single, public source. The NHP would not permit competing private insurance and would eliminate multiple tiers of care for different income groups. Practitioners and clinics would be paid predetermined fees for services, without any need for costly billing procedures. Hospitals would negotiate an annual global budget for all operating costs. For-profit, investor-owned facilities would be prohibited from participation. Most non-profit hospitals would remain privately owned. To reduce overlapping and redundant facilities, capital purchases and expansion would be budgeted separately, based on regional health planning goals. Funding sources would include current federal spending for Medicare and Medicaid, a payroll tax on private businesses less than what businesses currently pay for coverage, and an income tax on households, with a surtax on high incomes and capital gains. A small tax on stock transactions would be implemented, while state and local taxes for health care would be eliminated.40 Under this financing plan, 95 percent of families would pay less for health care than they previously paid in insurance premiums, deductibles, copayments, other out-of-pocket spending, and reduced wages. From the corporate viewpoint, the insurance and financial sectors would lose a major source of capital accumulation. At the same time, other large and small businesses would experience a stabilization or reduction in health care costs. Companies that do not currently provide health insurance would pay more, but far less than the cost of buying private coverage. National polls have consistently shown that about two-thirds of people in the United States favor the single-payer approach.41 Ninety-three members of Congress, led by Representative John Conyers and Senator Bernie Sanders, have co-sponsored single-payer legislation.42 What, then, are the obstacles to a single-payer plan, and should such a program be the ultimate goal for the U.S. health system? The coming failure of Obamacare will mark a moment of transformation in the United States, where neoliberalism has come home to roost. For that moment, those struggling for a just and accessible health system will need to address some profound changes that have occurred during the era of neoliberalism. These changes pertain to the shifting social class position of health professionals, and to the increasingly oligopolistic and financialized character of the health insurance industry. Physicians increasingly have become employees of hospitals or practices at least partially owned by large health systems. In a large 2015 survey, 63 percent of all physicians reported being employed, including 72 percent of women physicians.44 These changes mainly reflect the increased costs of owning a private practice, due to billing and other administrative requirements. In the average practice, annual overhead costs have reached about $83,000 per physician in the United States, compared to $22,000 in Canada.45 As a result, doctors mostly have become employees of hospital and health system corporations, where relatively high salaries tend to mask the reality of their employee status. In this context, it is important to reconsider the distinction between national health insurance (NHI) and a national health service (NHS). NHI involves socialization of payments for health services but usually leaves intact private ownership at the level of infrastructure. Except for a small proportion of institutions like public hospitals and clinics, under NHI the means of production in health care remain privately owned. Canada is the best-known model of NHI. The PNHP proposal and Congressional legislation that embodies the singer-payer approach are based on the Canadian model of NHI. An NHS, by comparison, involves socialization of both payment for health services and the infrastructure through which services are provided. Under an NHS, the state generally owns and operates hospitals, clinics, and other health institutions, which become part of the public sector rather than remaining under private control. In the capitalist world, Scotland and Sweden provide examples of NHSs, where most health infrastructure exists within the public sector and most health professionals are employees of the state. For such countries, the state apparatus includes elements that provide “welfare state” services, including health care, that, however vital, ultimately protect the capitalist system. In the socialist world, Cuba offers the clearest remaining model of an NHS where a private sector does not exist. In the United States, a legislative proposal introduced during the 1970s and 1980s by Representative Ronald Dellums explicitly adopted the goal of an NHS. The PNHP single-payer proposal emerged from a retreat in New Hampshire during 1986, where activists struggled with these distinctions. Although most participants at the retreat had worked hard for the Dellums NHS proposal, they reached a consensus—albeit with some ambivalence—to shift their work to an NHI proposal based on Canada. The rationale for this shift involved two main considerations. First, Canada’s proximity and cultural similarity to the United States would make it more palatable for the U.S. population, and especially its Congressional representatives. Secondly, a Canadian-style NHI proposal could be “doctor-friendly.” Under the PNHP proposal, physicians could continue to work in private practice, clinics, or hospitals. The main difference for physicians was that payments would be socialized, so that the physicians would not have to worry about billing and collecting their fees for services provided. While PNHP has achieved great success in its research and policy work, these efforts, and those of many other organizations supporting single payer, have not yet generated a broad social movement working toward a Canadian-style NHI. Meanwhile, the neoliberal model, with all its benefits for the ruling class and drawbacks for everyone else, has solidified its hegemony. Partly as a result, physicians and other health professionals are becoming proletarianized employees of an increasingly consolidated, profit-driven, financialized health care system. And under Obamacare, the state has continued to prioritize protection of the capitalist economic system, in this case by overseeing huge subsidies for private insurance and pharmaceutical corporations. Under these circumstances, it is no longer evident that socialization of payments for health services under a single payer NHI is the only goal toward which progressive forces should struggle.51 PNHP calls for the removal of for-profit corporations from U.S. health care. But that change will not occur within the context of capitalism as we know it. As neoliberalism draws to a close and as Obamacare collapses, a much more fundamental, socialist transformation needs to reshape not just health care, but also the capitalist state and capitalist society. ↩Congressional Budget Office, “,” March 2015, ; Rachel Nardin et al., “The Uninsured after Implementation of the Affordable Care Act: A Demographic and Geographic Analysis,” Health Affairs blog, June 6, 2013, http://healthaffairs.org. ↩Robert Pear, “Many Say High Deductibles Make Their Health Law Insurance All but Useless,” New York Times , November 14, 2015. ↩David Himmelstein and Steffie Woolhandler, “The Post-Launch Problem: The Affordable Care Act’s Persistently High Administrative Costs,” Health Affairs blog, May 27, 2015, http://healthaffairs.org; David U. Himmelstein et al., “A Comparison Of Hospital Administrative Costs In Eight Nations: US Costs Exceed All Others By Far,” Health Affairs 33, no. 9 (2014): 1586–94; Steffie Woolhandler, Terry Campbell, and David U. Himmelstein, “Costs of Health Care Administration in the United States and Canada,” New England Journal of Medicine 349, no. 8 (2003): 768–75. ↩“Health Insurance CEO Pay Skyrockets in 2013,” Health Care-NOW!, May 5, 2014, http://healthcare-now.org. ↩“National Health Expenditure Projections 2012–2022,” Centers for Medicare and Medicaid Services, http://cms.gov. ↩Richard A. Young and Jennifer E. DeVoe, “Who Will Have Health Insurance in the Future? An Updated Projection,” Annals of Family Medicine 10, no. 2 (2012): 156–62. ↩Howard Waitzkin, Medicine and Public Health at the End of Empire (Boulder, CO: Paradigm, 2011), chapter 8. ↩Howard Waitzkin and Celia Iriart, “How the United States Exports Managed Care to Third World Countries,” Monthly Review 52, no. 1 (May 2000): 21–35; Karen Stocker, Howard Waitzkin, and Celia Iriart, “The Exportation of Managed Care to Latin America,” New England Journal of Medicine 340, no. 14 (1999): 1131–36. ↩Alain C. Enthoven and K. Wayne Smith, How Much Is Enough? Shaping the Defense Program, 1961–1969 (New York: Harper and Row, 1971). ↩For more on the sources of neoliberal health reform in the military, see Howard Waitzkin, “The Strange Career of Managed Competition: Military Failure to Medical Success?” American Journal of Public Health 84 (1994): 482–89; Alain C. Enthoven, “Commentary: Setting the Record Straight—A Reply to Howard Waitzkin,” American Journal of Public Health 84 (1994): 490–93; Howard Waitzkin, “A Rejoinder,” American Journal of Public Health 84 (1994): 493–94. For Enthoven’s more recent packaging of the same perspective, see Alain C. Enthoven, “Market Forces and Efficient Health Care Systems,” Health Affairs 23, no. 2 (2004): 25–27; Alain C. Enthoven and Wynand P. M. M. van de Ven, “Going Dutch—Managed-Competition Health Insurance in the Netherlands,” New England Journal of Medicine 357, no. 24 (2007): 2421–23. ↩Alain C. Enthoven, “Consumer-Choice Health Plan,” New England Journal of Medicine 298, nos. 12 and 13 (1978): 650–58, 709–20; and Health Plan: The Only Practical Solution to the Soaring Cost of Medical Care (Reading, MA: Addison-Wesley, 1980). ↩Alain C. Enthoven, Theory and Practice of Managed Competition in Health Care Finance (Amsterdam: North-Holland, 1988); Alain C. Enthoven and Richard Kronick, “A Consumer Choice Health Plan for the 1990s,” New England Journal of Medicine 320, nos. 1 and 2 (1989): 29–37, 94–101; Paul Ellwood, Alain Enthoven, and Lynn Etheredge, “The Jackson Hole Initiatives for a Twenty First Century American Health Care System,” Health Economics 1, no. 3 (1992): 149–68. ↩For information about Obama’s switch from single-payer to market-oriented principles and the campaign contributions that supported this conversion, see: “Barack Obama on Single Payer in 2003,” http://pnhp.org; Brad Jacobson, “Obama Received $20 Million from Healthcare Industry in 2008 Campaign,” The Raw Story, January 12, 2010, http://rawstory.com. Obama’s support from the insurance industry deteriorated slightly in 2012: Center for Responsive Politics, “2012 Presidential Race,” http://opensecrets.org. ↩Deborah Levine and Jessica Mulligan, “Overutilization, Overutilized,” Journal of Health Politics, Policy and Law 40, no. 2 (2015): 421–37. ↩“Health Policy Brief: The CO-OP Health Insurance Program (updated),” Health Affairs, updated January 23, 2014, http://healthaffairs.org. ↩Entidad Promotora de Salud Organismo Cooperativo, Directorio de Empesas, Colombia, http://informacion-empresas.co. ↩Kip Sullivan, “How to Think Clearly about Medicare Administrative Costs: Data Sources and Measurement,” Journal of Health Politics, Policy and Law 38 , no. 3 (2013): 479–504. ↩Sharita R. Thomas et al., “A Comparison of Closed Rural Hospitals and Perceived Impact,” North Carolina Rural Health Research Program, April 2015, http://shepscenter.unc.edu; Chad Terhune, “Closure of Three Southland Hospitals May Be Part of a Trend,” Los Angeles Times , April 3, 2013. ↩Waitzkin, Medicine and Public Health at the End of Empire , chapters 9–10. ↩“Are Health Insurers Making Huge Profits?” The Economist , May 5, 2010, http://economist.com. ↩Nicole Lurie et al., “Termination of Medi-Cal Benefits,” New England Journal of Medicine 314, no. 19 (1986): 1266–68. ↩Ursula Giedion and Manuela Villar Uribe, “Colombia’s Universal Health Insurance System,” Health Affairs 28, no. 3 (2009): 853–63. ↩ World Health Report 2000 Geneva: World Health Organization, 2000), http://who.int. For critiques, see Celia Almeida et al., “Methodological Concerns and Recommendations on Policy Consequences of the World Health Report 2000,” Lancet 357, no. 9269 (2001): 1692–97; Vicente Navarro, “Assessment of the World Health Report 2000,” Lancet 356, no. 9241 (2000): 1598–1601. ↩Felicia M. Knaul et al., “The Quest for Universal Health Coverage: Achieving Social Protection for All in Mexico,” Lancet 380, no. 9849 (2012): 1259–79; Waitzkin, Medicine and Public Health at the End of Empire , chapter 9; Asa Cristina Laurell, “Three Decades of Neoliberalism in Mexico: The Destruction of Society,” International Journal of Health Services 45 , no. 2 (2015): 246–64. ↩Julio Frenk, “Leading the Way towards Universal Health Coverage: A Call to Action,” Lancet 385, no. 9975 (2015): 1352–58. ↩Howard Waitzkin, “Universal Health Coverage: The Strange Romance of The Lancet , MEDICC, and Cuba,” Social Medicine 9, no. 2 (2015): 93–97. ↩Nila Heredia et al., “The Right to Health: What Model for Latin America?” Lancet 385, no. 9975 (2015): 34–37. ↩Amanda L. Glassman et al., From Few to Many: Ten Years of Health Insurance Expansion in Colombia (Washington, DC: Inter-American Development Bank, 2009). ↩Thomas C. Tsai, “Second Chance for Health Reform in Colombia,” Lancet 375, 9709 (2010): 109–10. ↩Ingrid Vargas et al., “Barriers of Access to Care in a Managed Competition Model: Lessons from Colombia,” BMC Health Services Research 10, no. 297 (2010): 1–12, http://biomedcentral.com. ↩César E. Abadía-Barrero, “Neoliberal Justice and the Transformation of the Moral: The Privatization of the Right to Health Care in Colombia,” Medical Anthropology Quarterly (October 21, 2014). ↩Senator Jorge Robledo, “Saludcoop: The Greatest Robbery of Public Assets,” speech in a plenary session of the Colombian Senate, September 9, 2014. Published October 15, 2014, http://colombiasupport.net. ↩Physicians for a National Health Program, “Proposal of the Physicians’ Working Group for Single-Payer National Health Insurance,” submitted for publication, http://pnhp.org; Himmelstein et al., “A National Health Program for the United States: A Physicians’ Proposal”; Kevin Grumbach et al., “Liberal Benefits, Conservative Spending: The Physicians for a National Health Program Proposal,” JAMA 265, no. 19 (1991): 2549–54; Charlene Harrington et al., “A National Long-Term Care Program for the United States: A Caring Vision,” JAMA 266, no. 21 (1991): 3023–29. ↩Gerald Friedman, “Funding HR 676: The Expanded and Improved Medicare for All Act: How We Can Afford a National Single-Payer Health Plan,” http://pnhp.org. ↩“New Poll on Single Payer and a Medicare Buy-In,” survey conducted by GBA Strategies, January 9–15, 2015, http://pnhp.org. ↩“The Expanded & Improved Medicare For All Act (H.R. 676),” Physicians for a National Health Program, http://pnhp.org. ↩Barbara Ehrenreich and John Ehrenreich, “The Real Story behind the Crash and Burn of America’s Managerial Class,” Alternet, February 13, 2013, http://alternet.org; Barbara and John Ehrenreich, “The Professional-Managerial Class,” Radical America 11, no. 2 (March/April 1977): 7–31. ↩Dante Morra et al., “US Physician Practices Versus Canadians: Spending Nearly Four Times As Much Money Interacting with Payers,” Health Affairs 30, no. 8 (2011): 1443–50. ↩John D. Stoeckle, “Working on the Factory Floor,” Annals of Internal Medicine 107, no. 2 (1987): 250–51. ↩John B. McKinlay and Joan Arches, “Towards the Proletarianization of Physicians,” International Journal of Health Services 15, no. 2 (1985): 161–95; Adam Reich, “Disciplined Doctors: The Electronic Medical Record and Physicians’ Changing Relationship to Medical Knowledge,” Social Science & Medicine 74, no. 7 (2012): 1021–28. ↩Eric Hobsbawm, “Lenin and the ‘Aristocracy of Labor,'” Monthly Review 64, no. 7 (December 2012): 26–34. ↩Samir Amin, “Contra Hardt and Negri: Multitude or Generalized Proletarianization?” Monthly Review 66, no. 6 (November 2014): 25–36. ↩In this sense, the financial flows of health insurance cohere with Foster’s comment, “At the more stratospheric level represented by contemporary finance, the general formula for capital, or M-C-M′, is being increasingly supplanted by the circuit of speculative capital, M-M′, in which the production of use values disappears altogether and money simply begets more money.” John Bellamy Foster, “The Epochal Crisis,” Monthly Review 65, no. 6 (October 2013): 1–12. ↩Howard Waitzkin, ed., The Collapse of Capitalist Health Care and the Road Ahead (New York: Monthly Review Press, 2016, forthcoming).